Includes: tricorn hat, jacket, waistcoat, lace trimmed jabot, knickers, knee high boot tops. Costume of high quality with the attention to detail. Size SMALL (38-40),MEDIUM (42-44), LARGE (46-48), XLARGE(50). Costume delivered with a custom zippered garment storage bag. Material content: 100% polyester exclusive of decorations. 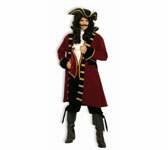 Please click on: FORUM NOVELTIES COSTUMES SIZING CHART for sizing information.